This is a really tricky subject for most of us, especially if you lead teams or own your own business. Let’s talk about how to fire someone. Okay, so… before you press pause, say NOPE and move on to another episode, hear me out! This isn’t all doom and gloom and I dare say, these skills might help you in other aspects of leadership, communication and catching the warning signs when things, projects or people are about to go awry. Before you make your first hire, you get really, really good at storing EVERYTHING up in your brilliant brain. The buck stops with you. You handle sales and invoicing, pitching, social media marketing, designing, creating and delivering your products and services to your beloved clients. It’s all you – all of the time. And then something happens… you become wildly successful and you’ve got to scale (and FAST) in order to keep up with the sheer amount of work on your plate now. That’s a good problem to have. But if you’ve got ZERO experience managing people, this can be a tricky transition to navigate. And let’s face it… your first one or two hires (or fires!) might be where you cut your teeth on things, make a few mistakes and gain some massive lessons learned. So, here we are… the wheels have come off the bus. Your team member is consistently showing up to work late, missing deadlines, is distracted at meetings, or acting a bit off. Before taking drastic action, get a clear picture of what’s actually going on. Why are they so unhappy? Is it something you’re causing, or are there outside forces at play here? The very best way to assess the situation is to call a face-to-face meeting as soon as you notice things are slipping. Don’t delay. Don’t pretend it’ll go away. Don’t be afraid of confrontation… all of this will only make things worse. This is NOT the time for you to do the talking. If they’re frustrated with their workload or having a conflict with another team member, or something else is bothering them, you want them to share it, in their own words. This is to help them get confirmation that you heard things correctly and truly understand them. Let your team member come up with their own solution. Tick, check, let’s move on swiftly. If they can’t come up with a solution on the spot, ask them to respond within the next 24 hours. And if there still isn’t a solution from their side, you’ll will need to provide one yourself. Either way, the corrective action you take must be trackable, realistic, and mutually agreed upon within a timeframe. Document your meetings – always. It’s time to follow up with your team member. Did they do the thing? What about you, as their boss? Did you do what you said you would? Have things improved or got worse? This is the “come to Jesus” moment where swift action must be taken if things are continuing to go downhill. If your mentoring efforts, training and guidance aren’t working, and your team member is still missing the mark – it’s time to let them go. I’m not going to lie… firing someone is not easy. Take the emotion out of the situation and take action swiftly. Make sure you’ve got all client files backed up and access to all logins and passwords before you do anything. The last thing you want is someone wiping your documents in a passive aggressive rage. Not that your person is gonna do that, but hey, you never know. Once you’ve backed things up, I want you to review their employment or freelancer contract. What are the stipulations in place for termination? Make sure you’re doing all things, by the books. If there is a promise of notice time, payout of unused vacation days or other details, make sure you’ve got it all outlined in their termination letter and written transition plan. Getting fired is no fun for anyone. But there’s a way to do this with professionalism and a certain level of kindness. You could offer a letter of recommendation and/or introductions to others in your industry to help them along in their future job search, as you see fit. Your offer of sincere support moving forward may not be appreciated in the moment but it might be felt in the coming weeks ahead, once they get past this crappy day. And here are the suggestions of how to handle them. Listen to what they say to you after they receive the news. 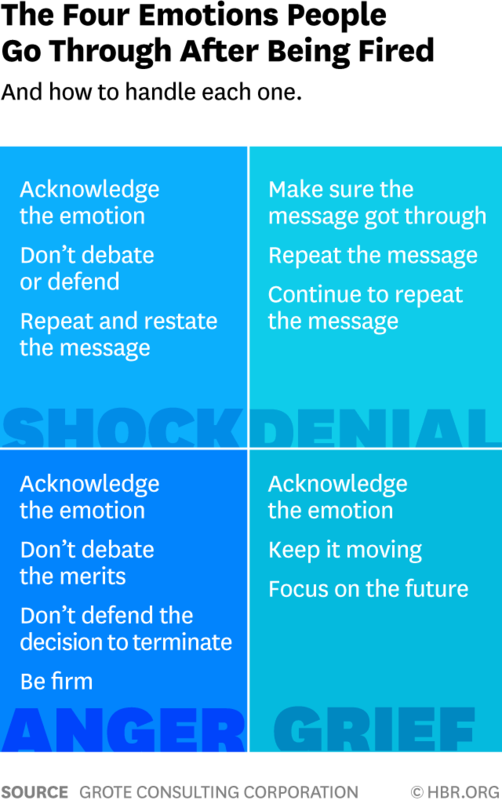 Your response will be more effective if you know what the driving emotion is underneath. Bottomline – acknowledge the emotion, don’t debate or defend the decision and focus on the future. Confrontation is hard but necessary. If you allow a situation to go from bad to worse, it’ll affect others on your team, the quality of work you deliver to your clients, and take a toll on your mental health over time. That’s why the 5 step process to firing someone is mostly focused on how to course-correct the situation rather than have the knee jerk reaction to get rid of them first. If you can salvage the situation, go for it. But if you can’t, don’t delay. Take swift action. Do this final meeting at the end of the workday, do it with dignity and thank them for their contributions to the company. Shake hands and move on with your lives. If you know someone who could really use this advice, would you mind sharing it with them? Simply copy and paste – https://thesimplifiers.com/thepodcast/ – and kick it to them in a text or an email and we’ll do the rest.